The Luxury Band from Moscow performed at the RCSC on June 8. The Luxury Band from Moscow performed at the Russian Centre of Science and Culture on June 8, heralding celebrations for the Day of Russia. 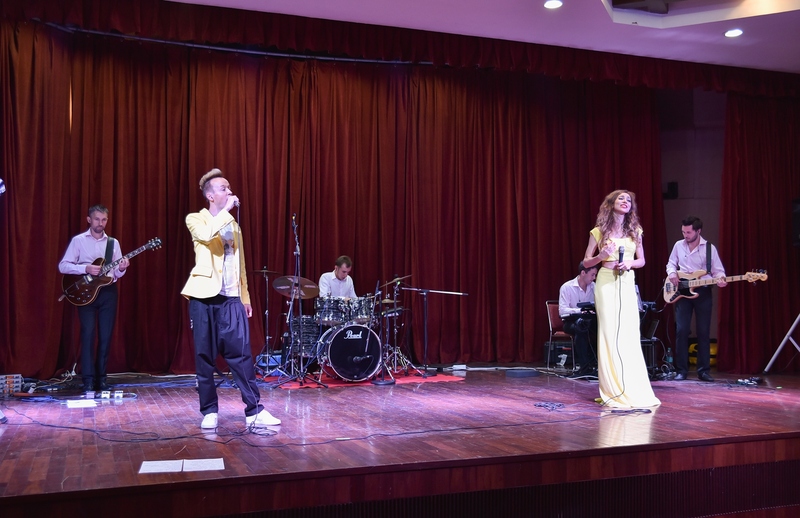 Moscow’s famous “Luxury Band” gave a performance at the Russian Centre of Science and Culture (RCSC) in New Delhi on June 8, 2016, enthralling the audience. The function, jointly organised by the Russian Embassy, heralded the celebrations dedicated to the Day of Russia. An audience comprising diplomats, art lovers, social activists, Russian compatriots, students, media persona and others attended the programme. The chief guest at the evening’s performance was H.E. Alexander Kadakin, Russia’s Ambassador to India. Other dignitaries included Major Dalbir Singh, Secretary, All-India Congress Committee, Prof. Ramadhikari Kumar, President, Indian Association of Teachers of Russian Language and Literature, Prof. Sankar Basu, President, Indian Alumni Association of Soviet/Russian Academic Institutions and Fedor Rozovskiy, Director, RCSC. The splendid musical performance involved Russian folk songs, Russian movie songs, popular international songs, including a Hindi movie song, synchronised with thrilling dance numbers. Profuse applause and a standing ovation from the audience testified to the excellence of the artists’ performance. The main attractions of the performance were the well-known songs “Gi Moroz Moroz”, “Kalinka-Malinka” and “Moscow Evenings”. The soloists were Maria Akimova and Alexander Ikonnikov. Other participants included Vladimir Solovyh (bass), Nikolai Kulikov (solo guitar), Mikhail Borychev (drums), Andrey Grigoriev (piano). Ilia Lunev was the sound director and Diana Navina Gulab and Julia Kuzmina were the dancers. Winners of many competitions, including High-Heels Competitions 2015-2016, the ‘Luxury Band’ Jazz team have performed in all CIS Countries in all weather conditions, ranging from -47 degrees C in Jakutia to + 43 degrees C in Delhi. Artists in the band are mostly graduates from the musical academy, named after Gnesins. They had performed in many Russian and international musical festivals. Each show of this amazing band is a real treat for connoisseurs of music. RCSC Director Rozovskiy felicitated the artists after the performance.